If you’re looking to do something patriotic in light of the recent election, you may not need to look any further than your Holiday card order. 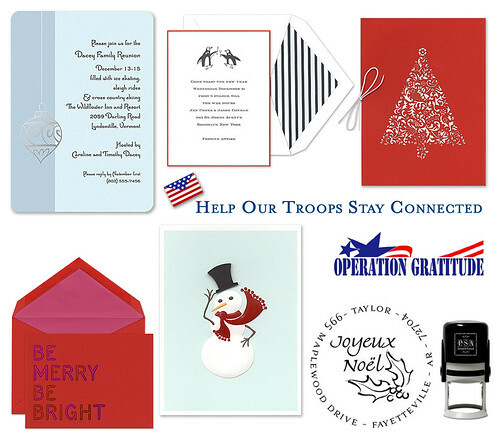 When you purchase Holiday themed merchandise totaling $50 or more before December 31, FineStationery.com will donate stationery to Operation Gratitude to be included in care packages for U.S. soldiers deployed overseas. red tree card by Crane & Co.
Operation Gratitude is a non-profit, all-volunteer organization that annually sends 100,000+ care packages addressed to individually named U.S. Service Members deployed in hostile regions such as Iraq and Afghanistan, and on military ships at sea. Its mission is to lift morale, bring a smile to a service member's face and to express to all troops the appreciation and support of the American people. Since its inception in March 2003, Operation Gratitude has shipped more than 350,000 packages to American troops deployed overseas.